The Internet is home to a wealth of coupon and price comparison sites, but getting to a price you're willing to pay for new tech items can still be time consuming. Greentoe, however, is looking to save you time as well as money when shopping online for things like photography or home theater equipment, appliances, musical instruments and even baby gear. Here’s why: Just like Priceline lets you name your own price on travel, Greentoe lets you negotiate the price of what you pay for tech products. Here's how it works. Greentoe shows you the price range for each item, to give you a sense of what you'd normally pay. Then you put in an offer on the tech item you'd like to purchase. The meter tells you the likelihood of a retailer accepting that offer. 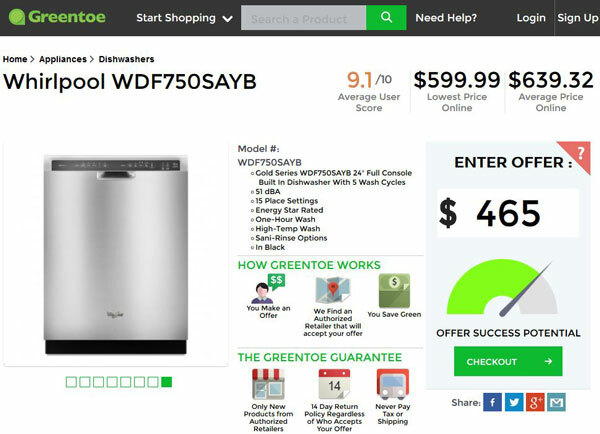 For example, I happen to be in the market for a dishwasher and, according to Greentoe the one I’m interested in sells cheapest for $599. I tried low-balling the meter with several numbers but it wasn’t until I suggested $399 that the needle hit the half-way mark on the offer meter, right in the yellow "maybe" zone. At $465 the meter showed green, indicating I should finalize the offer. Only after you've gone through the checkout process, do you see who the reseller is. To checkout, you have to sign up with Facebook or Google, input your billing and shipping addresses as well as your credit card information. Once you do so, Greentoe throws your offer out to a list of retailers, and if one of them accepts it, the deal is done. The company does not share your credit card information with its network of retailers, which is made up of both small and big-box merchants. A few things to keep in mind. All purchases on Greentoe are for new products from authorized retailers, so they’re covered under manufacturers’ warranties. Negotiated prices include tax and shipping. And, you can return anything within 14 days after you receive it. Get the Techlicious Guide to Great Photography as your FREE gift!